If you’re using tax preparation software on your Mac, such as those from TurboTax or H&R Block, chances are you’re not too worried about printing your tax returns to send to the IRS. These applications typically offer you the option of filing your taxes electronically. But, if you prefer to keep a hard copy of your tax returns for future reference—rather than a PDF file saved somewhere on your computer—these applications offer you options for printing all or portions of your state and federal returns. While each of these applications handles the printing of tax forms in a slightly different manner, both use specialized dialog windows within which you can select the types of returns, or selected portions of a return, that you want to print. After you’re done selecting what you want printed, these apps hand the print job off to what is, for the most part, your default Mac OS X print dialog. There, you can make printer-specific changes to how your forms are printed, such as using duplex printing, or collating the documents. Intuit’s TurboTax application offers three distinct options for printing your tax returns: Print Returns for Filing; Print Returns for Your Records; and Print Selected Forms. The first two options differ very slightly from each other. TurboTax's Print Returns for Filing first checks to make sure your numbers are correct. 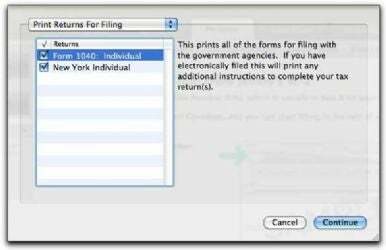 Print Returns For Filing checks your return for errors and encourages you to fix those errors before printing the document. If you choose not to correct the errors, TurboTax compiles all the necessary forms and then passes the print job on to a standard Mac OS X print dialog box. Print Returns For Your Records does not perform any error checking and gives you three print options from which to choose. You may choose to print only the selected tax return, print Intuit’s suggested selection of forms, or print all the forms and worksheets associated with the selected return. While it does not check your numbers, Print Returns For Your Records does offer a choice in what documents to print. 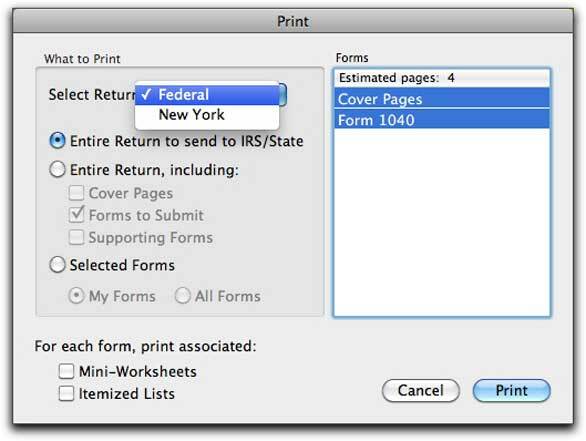 Print Selected Forms does not perform any error checking and allows you to select and print any of the forms, worksheets, or instructions that are associated with your state or federal tax return. 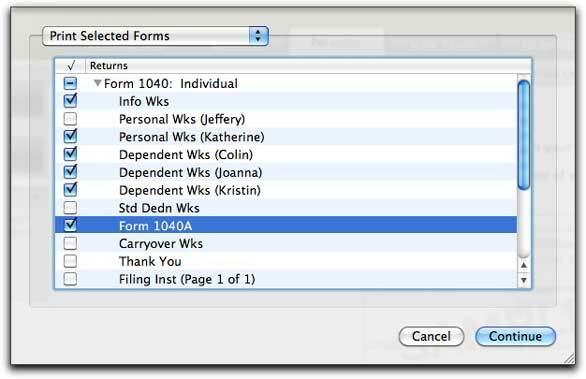 The Print Selected Forms option lets you print any documents associated with your return. TurboTax does have one standard print dialog oddity: you won’t find a Print Preview option. So, if you’d like to preview your entire tax return before you print a physical copy, you’ll need to use the PDF button at the bottom left-hand corner of the Mac OS X dialog box, save your tax return as a PDF file, and then preview your return using Apple Preview or Adobe Acrobat Reader. If you’re satisfied that the PDF copy is correct, it’s not necessary to reprint it using TurboTax; you can simply use Preview or Reader to print the document. There isn’t much difference between H&R Block 2010 and TurboTax when it comes to the types of print options offered. Like TurboTax, H&R Block 2010 offers you three choices for printing your tax returns. But the implementation of those options is more streamlined and intuitive. For example, H&R Block does not check your return for errors when you select Print from the File menu; rather, it checks your return when you use the File Your Return section of the application. H&R Block's printing implementation is intuitive and gives you choices of what to print. When you print your forms using H&R Block 2010, you must first select whether you want to print your state or federal return. Once selected, you can then choose from several options: print only the forms required for mailing your federal or state return; print the entire return with an optional selection of forms; or print only the specific forms you want. You can print all your forms and associated documents easily. H&R Block 2010 also offers you the option to print a worksheet and an itemized checklist for every form you print. Like TurboTax, once you’ve selected the items you want to print, the job goes to the default Mac OS X print dialog box. With H&R Block however, you do have the option of previewing your print job from the application's print dialog before you send it off to the printer. You can pick and choose which documents you want to accompany your printed tax form.